The bestselling, award-winning author of The Last Summer of the Camperdowns returns with another rollicking, summertime family saga. Maine’s rugged, picturesque Monhegan Island is home to weathered lobster fishermen and curious tourists, a genial if sleepy group. But when Spark Monahan―rakish prodigal son―returns unannounced to the dilapidated family home, his arrival launches a summer the likes of which this quiet town has never seen. During Spark’s absence, his young son Hally has been cared for by what remains of the Monahan family: Spark’s gentle brother Hugh and their shrewd, fork-tongued father Pastor Ragnar. Pastor Ragnar has led them with an iron will and a unique religious ideology, while Hugh has been busy mending the scars of a tumultuous family history. Spark’s reentry into the family is rocky; even as adolescent Hally warms to his father’s flair for mischief, he struggles to define himself against this new paternal figure. Testing the limits with one dangerous prank after another, Hally suddenly stuns the entire island when he claims to have had a spiritual vision. Though Spark remains permanently dubious about the alleged apparition, Pastor Ragnar pounces on the chance to revive his flagging church. Hally is shoved into the spotlight, and in the frenzy that follows, each man in the family fights for independence, understanding, and ultimately forgiveness against the tide of a phenomenon reaching far beyond the slippery slopes of their remote island home. Their unforgettable saga is told by the character best suited to sniff out the family’s uneasy secrets: Spark’s charismatic, fiercely loyal dog, Ned. Never at a loss for a quip on the stormy affairs of the Monahan family, Ned tells their larger-than-life story with humor and love from his uniquely privileged perspective. 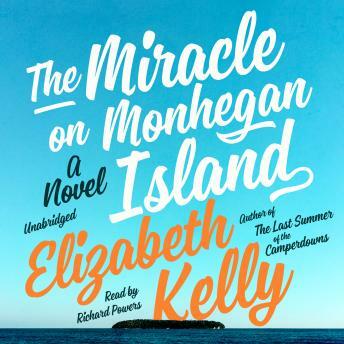 An uproarious tale of an eccentric family of fathers and sons, The Miracle of Monhegan Island is another delightful summer blockbuster from Elizabeth Kelly.